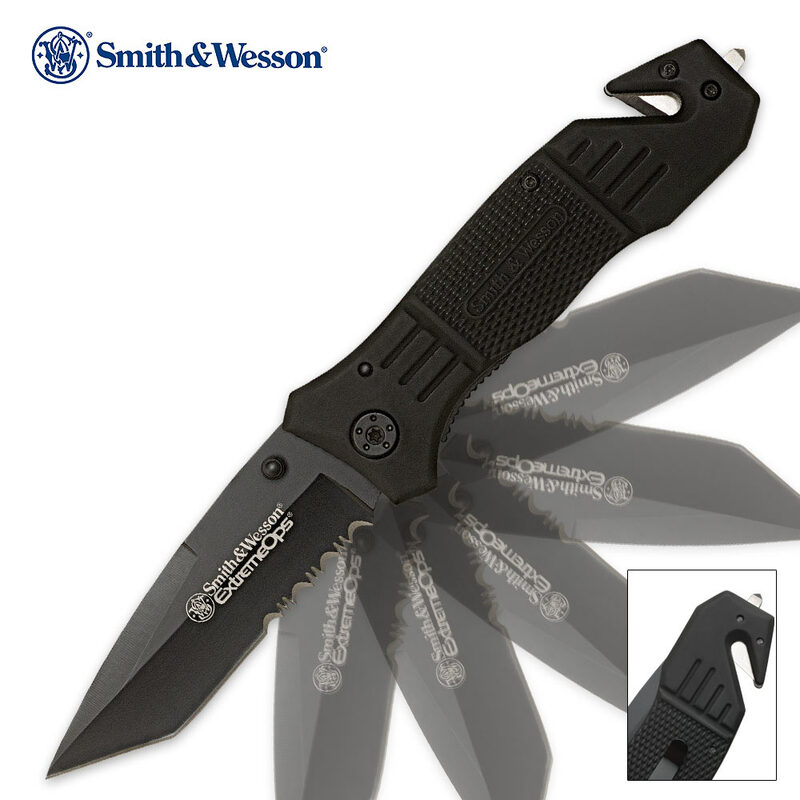 Smith and Wesson First Response Pocket Knife | BUDK.com - Knives & Swords At The Lowest Prices! Expertly designed to meet the needs of First Responders, the stainless steel serrated blade is razor sharp. This first responder pocket knife also features a thumb stud, liner lock black rubber inset, seat belt cutter, and glass breaker to meet all your first-response needs. I've had this knife for 1-2 years now, and it's been my daily carry. It's very thin, so it carries well clipped to the inside of the pocket. I love the rubberized coating, though mine is definitely showing some wear with silver peeking through here and there. Very solidly built. 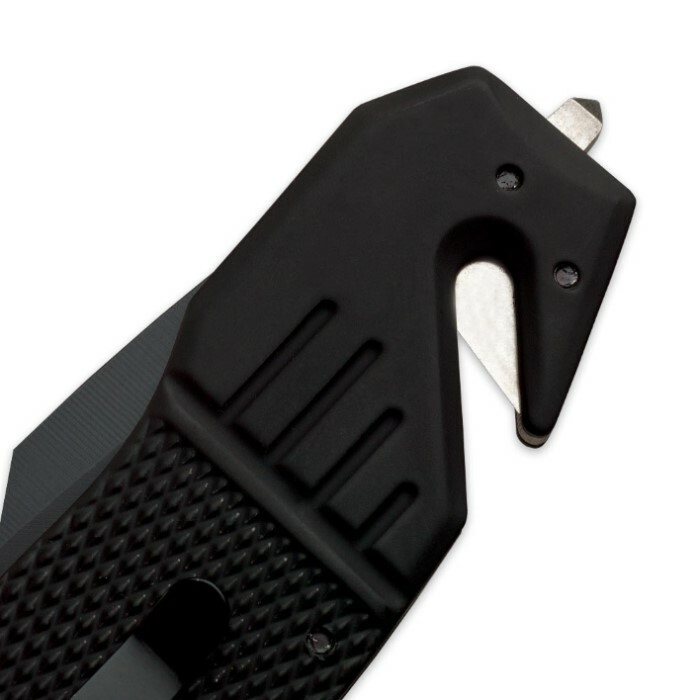 I like the fact that the seatbelt cutter has a narrow opening... a lot of the cheaper ones seem to leave a huge gap, making it much easier to accidentally hang the razor on something (like a finger!). My one and only complaint is that one of the tiny torx screws holding the belt clip on won't stay tight, and the center of the screw stripped out when I attempted to fix it, so my clip has some wiggle to it. Other than that, it's been rock solid. Very recommended! WOW! This thing is awesome. I'm not a huge fan of assisted opening knives so for the price this was my best choice and boy am I not disappointed. The tanto design for the blade is really nice, and the serrated edge is just insane. The feel is absolutely fantastic and belt cutter and center punch are a great addition. I will for sure carry this as an EDC. Thanks Smith & Wesson! This knife in a good size and is a solid piece of equipment. However it falls short, in my opinion, by not having spring assist. The seatbelt cutter and window breaker are a nice touch and I like the Tanto blade design. But the knife does not open as smoothly or one handed as a spring assist does. I would put it up against some of the more expensive knives I have...I carry it for daily use at work. I bought this knife for a friend who is in law enforcement. He says he gets a lot of use out of the knife and that it is a great utility knife. I have had a Smith and Wesson for years, and gotten excellent use out of it. The First Response knife is a fine addition. Having the seat belt cutter and glass break features added to a sturdy working knife has allowed me to remove a cutter/breaker tool from my key chain. The grip is firm, and the blade is sturdy and sure. I carry it every day. i like the knife. a great knife for the price. it is also very good throwing knife because it is balanced. sharp right out of the box. very glad i bought the knife!